Nassos has graduated from Computer Engineering and Informatics Department in the University of Patras. He also holds a Master degree in Communication and Network Systems from University of Athens. He has a 10-year work experience as a Java and C++ developer in the Telecommunication and IT industry participating in various projects. He currently works as a senior software developer in the IT sector where he is mainly involved with projects for the EU requiring extensive java skills. 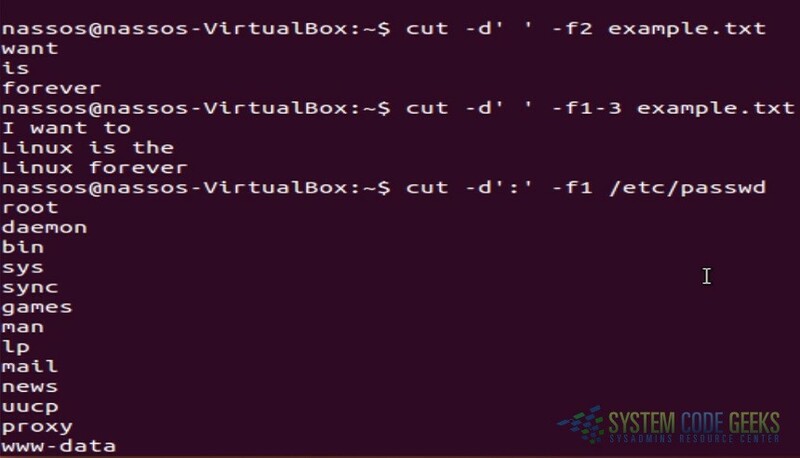 In this post, we feature comprehensive Linux cut Examples. Cut is a Unix command line utility which is used to extract sections from each line of input, usually from a file. It is currently part of the GNU coreutils package and the BSD Base System. It first appeared in AT&T System III UNIX in 1982. Extraction of line segments can typically be done by bytes (-b), characters (-c), or fields (-f) separated by a delimiter (-d — the tab character by default). A range must be provided in each case which consists of one of N, N-M, N- (N to the end of the line), or -M (beginning of the line to M), where N and M are counted from 1 (there is no zeroth value). Basically the cut command slices a line and extracts the text. I want to learn linux, learn linux, learn linux. The cut command can be used to print characters in a line by specifying the position of the characters. To print the characters in a line, use the -c option in cut command. The below cut command prints the fourth character in each line of the file. You can also print more than one character at a time by specifying the character positions in a comma separated list. You can use the cut command just as awk command to extract the fields in a file using a delimiter. The -d option in cut command can be used to specify the delimiter and -f option is used to specify the field position. The below cut command prints the second field in each line by treating the space as delimiter. You can also print more than one fields by specifying the position of the fields in a comma delimited list. These examples are nice, but I don’t care for the format of showing screenshots after 3 commands. It’s just a little distracting. Nice tutorial, though.